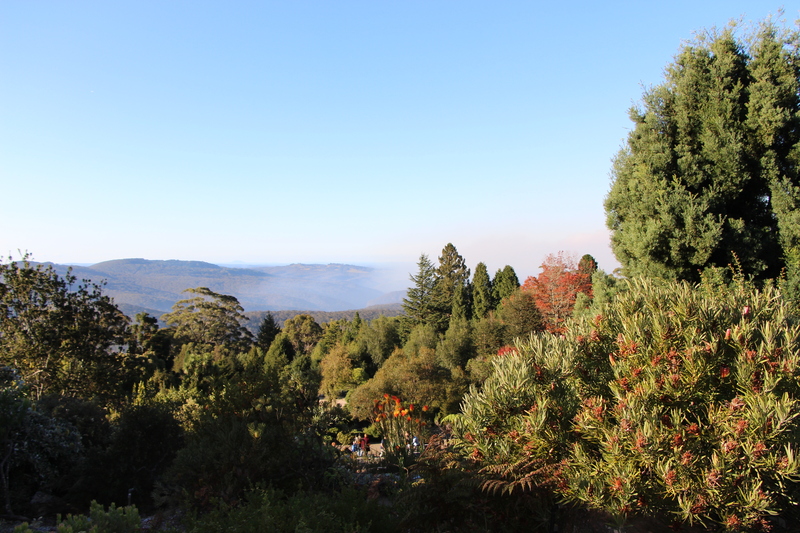 Recently I spent a polka dot filled weekend in the Blue Mountains (NSW) with my husband, Dave. Dave is an ideas man, but not only does he have the ideas he follows through and makes those ideas come to life. It’s very exciting to be me (sometimes – depends on the idea! 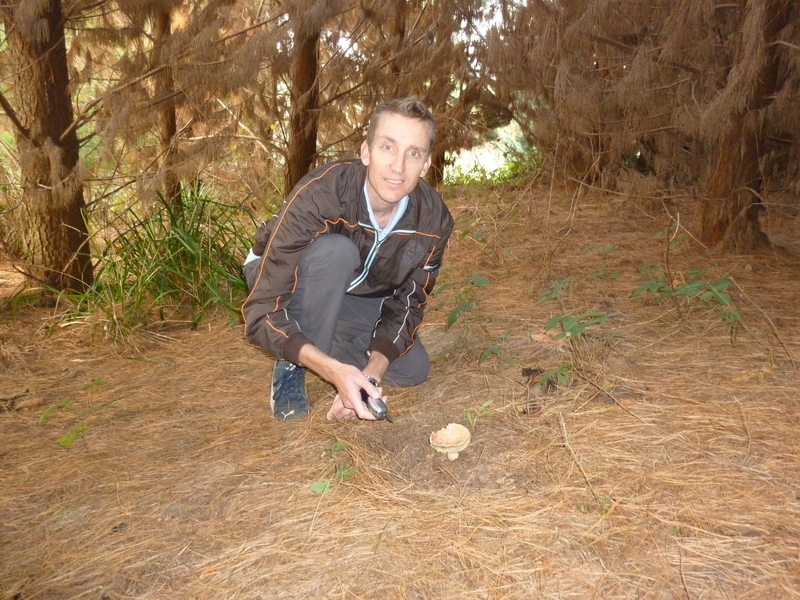 )… and this time the idea was mushroom picking in a pine forest which we did near Oberon, west of the Blue Mountains. Dave did all the research required including what mushrooms would be growing, what mushrooms to avoid, where they were growing and how to find them. So we set out from Leura after a spot of shopping (Yay! 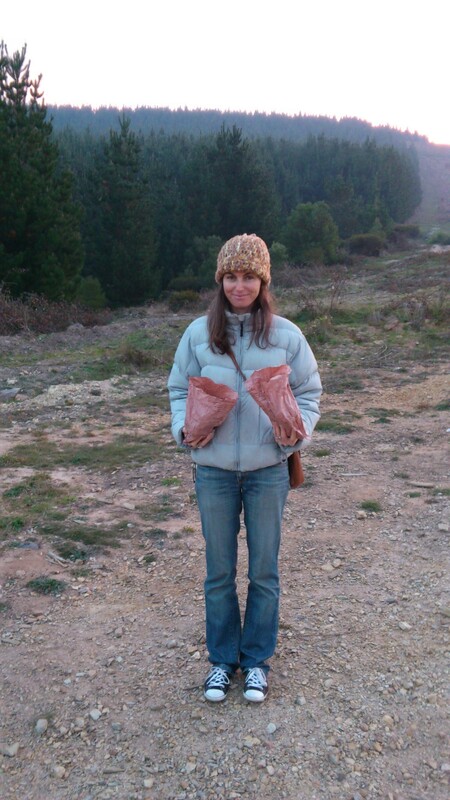 that was my idea) to find a pine forest that would yield us our mushrooms. 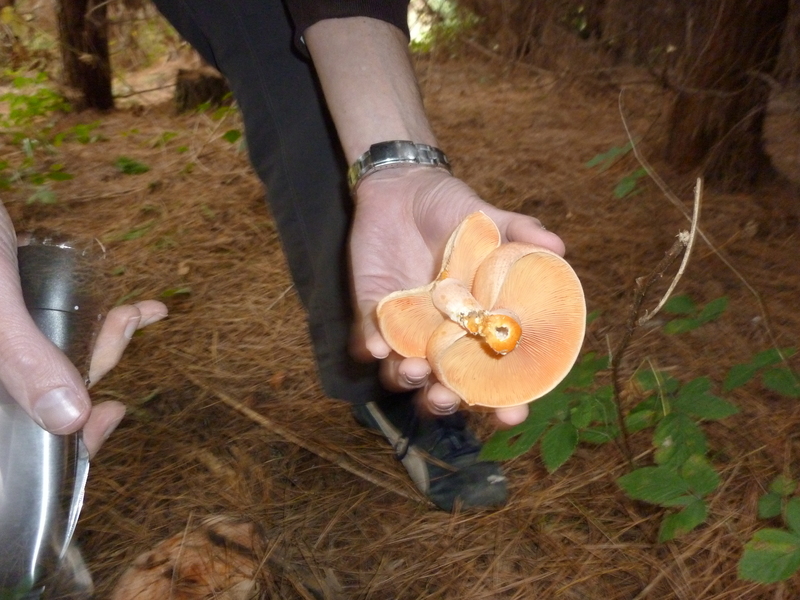 Foraging and finding – perfect! The mushrooms that we were looking for were wild mushrooms, in our case Saffron Milk Caps. They can be found in pine forests from late February to early May. We drove looking for Hampton State Forest – persistence is the key here. After driving for what felt like ‘too long’ we came across the odd cluster of pine trees, then some more clusters of pine trees. These were either too difficult to get to or didn’t have any mushrooms. So we kept driving and there it was, football field after football field sized areas of stumps. The loggers had been and there were no trees in sight. But, we didn’t give up, we kept driving until on the not too distant horizon we could see the tips of more, lots more trees, enough pine trees to be called a forest. And that is exactly what we were looking for. Careful does it. 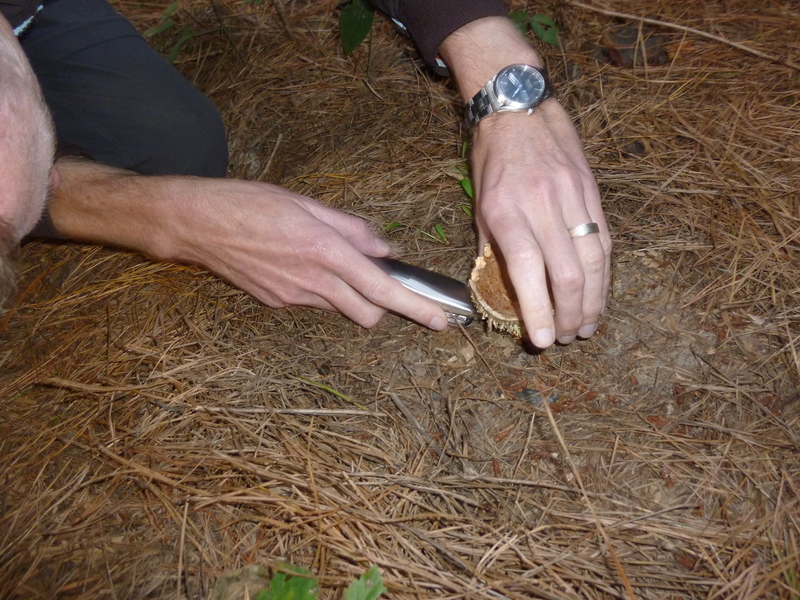 Once you have cut the stem you cover the part that is left in the ground with pine needles, that way you encourage the mushroom to shoot again next year. I should mention here that there was no skipping, only precarious foot steps to avoid treading on pine needle obscured mushrooms or running into a spider’s web (I didn’t want to disturb any of the wild life either). There was no basket (because I forgot to bring it – shame on me and my mushroom foraging), but we did have, you guessed it, recycled paper mushroom bags, the ones we all know and love. There was however a hillside cabin to return to, but no cooking, we waited until we were in our own kitchen (to keel over and pass out…) to cook them. All up we collected about two bags worth of mushrooms to take home, that was plenty for the two of us. The mushrooms travelled back to Sydney with us where Dave cooked up a pot of soup. I have to be honest the images crossing my mind of newspaper headlines containing my name very close to the words fatal and mushroom did not help my wild mushroom soup go down. I tried but there was a very definite divide within my brain, ‘it’s totally fine – we’ve done the research’ and ‘it’s oh so not fine – we’ve never done this before’. Even after each mouthful Dave had, I asked if he was ok.
Wild mushroom soup. It’s orange due to the bright orange sap that seeps out of the cut end of the mushroom. Even while eating the soup I kept searching the internet for things that would ease my mind. But it wasn’t very ‘eased’ when Deathcap Mushroom came up in a Google search. 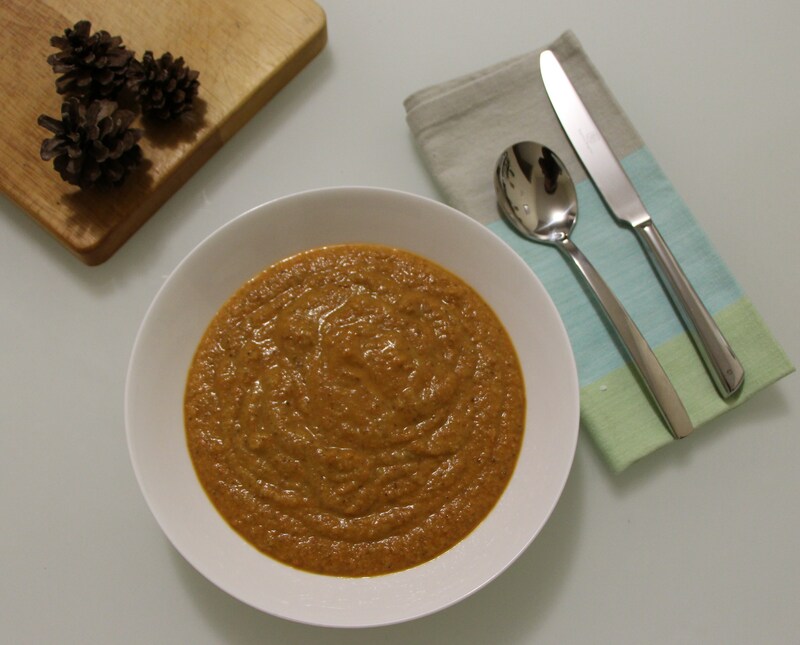 Sadly I didn’t finish my soup, as I write this it sits waiting in my fridge at home. And that brings up a whole other concern, ‘should you keep wild mushroom soup?’, ‘will mushrooms that have been cooked and stored produce a highly toxic substance that renders them DANGEROUS???’. Reasonable or unreasonable, I’m not too sure! I cannot stress to you enough that you should never, ever eat wild mushrooms unless you are 100% certain that you know what the mushroom is and that it is non toxic and suitable for eating. Some mushrooms are highly poisonous and eating them could be fatal. If you are not sure of the identification of the mushroom, don’t touch them, leave them where they are. A leaflet and directions are available from the Oberon Visitor Information Centre. Dave and I survived… of course we survived, we had done the research and knew exactly what we were picking and eating. When there was any doubt as to the identification of a mushroom we left it alone. As they say, it is better to be safe than sorry. I never pictured myself skipping in the forest picking mushrooms. I have been doing it since I was really young. The more common feeling of picking mushrooms is the branch in the eye. Most poisonous mushrooms are very bitter between the stem and the cap. Also the ones with the spots are not good. If insects don’t eat them it is a sing that they might be poisonous. Thanks for reading my post. There aren’t many places that you can safely pick mushroom where I am so I took the opportunity when I could and will hopefully do it again next autumn.